As the head of nutrition policy here at Herbalife, my role blends science, policy and regulation; that’s why Michelle Obama’s recent announcement at the Partnership for a Healthier America meeting at the White House is important to my job at Herbalife and to the company in general. The First Lady of the United States announced that the U.S. Food and Drug Administration (FDA), has a change in store for food and supplement labels. These changes will appear on food and supplement products over the next couple years and they are intended to help consumers make informed choices about what they’re eating. New labeling requirements have been approved and these include some important updates that reflect current consumer behavior and our evolving understanding of nutrition science. 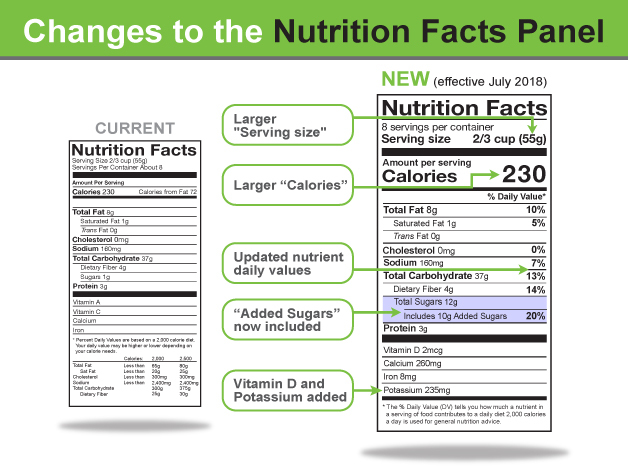 The changes that impact consumers the most are reflected in a revised Nutrition Facts (and Supplement Facts) panel – the main area of the label that includes the relevant nutritional information for products. When it comes to weight management, calories are key. So it follows that the biggest change is a strong emphasis on total calories. The type size for calories has been significantly increased and bolded for “Calories,” “servings per container,” and the “Serving size” declaration. Sugar is now put in better balance. By including “Added Sugars” (sugar that is added to products to sweeten them, in contrast to naturally occurring sugars) under “Total Sugars,” consumers will have more information about the amount of added sugar they consume throughout the day, potentially reducing excessive sugar intake that can have negative health impacts. Nutrients of concern have been updated. Americans are not achieving recommended intakes for vitamin D and potassium. Manufacturers now must include the amount of vitamin D and potassium, in addition to calcium and iron. Vitamins A and C levels are no longer required although manufacturers can voluntarily declare these, along with the amounts of other vitamins and minerals. “Calories from Fat” is being removed. Evolving research now shows the type of fat is more important than the amount. More accurate Serving Size. The FDA is requiring serving sizes listed on labels to reflect more closely what people typically consume. For example, a 20 oz. beverage will be listed as a single serving, rather than multiple servings, since consumers typically consume the entire beverage at one time. Finally, daily values (DV) for sodium, dietary fiber and vitamin D are being updated to align with the Institute of Medicine’s recommended intakes and the 2015-2020 Dietary Guidelines for Americans. This is the first update to the label since 2006, when Trans Fat was added, and manufacturers will need to implement the new label by July 2018. We support these changes and applaud the FDA for making this timely update.